The eighth edition of International Children’s Film Festival ended on Friday with fanfare, film screening and award giving ceremony at the main auditorium of Bangladesh National Museum. Awards were given in four categories to eight films and filmmakers. Eminent artist Mustafa Monowar, also chairman of festival advisers’ council, handed over the awards to the winners. 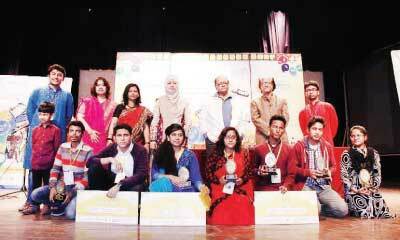 Writer Mohammad Zafar Iqbal, chairman of Children’s Film Society Bangladesh; Rayeed Morshed, festival director, and others were present at the award-giving ceremony. Bangladesh young filmmaker Abrar Faiz’s film Satasfurta (Spontaneous) won the best film award in the main category called Children Filmmakers section. Farah Jabin Oishee’s Long Way to Go and Ashfak Sakib Shafin’s Abhipray respectively won second and third best film awards. Two more films- Asif Shahriar’s Padakkhep and Raju Ahmed’s The Flag- were given special mentions. All the winners were given crests and certificates, whereas makers of the best three films were also awarded money to facilitate their next films. In the International Filmmakers section German film Nona on Pie won the best feature film award, while Iranian film All the Winters I Haven’t Seen won the best short film award and Indian maker Rahin Ravindan won the best director award for his Little Hands. Bangladeshi young filmmaker Asif Khan’s The Poster won the best film award in the Young Bangladeshi Filmmakers section. Aditi Sabur for her film Ahuti won the Social Film section award. A number of films were also screened at Shawkat Osman Auditorium of Central Public Library, the main venue, on the last day. ‘The festival has been a successful one. In spite of the political unrest, we got huge audience every day,’ said Rayeed Morshed, festival director. For blockade and strike, we could screen films only at five venues in Dhaka and only in one venue in Chittagong, though originally we had planned to screen films in all the divisional headquarters, he said. Over 200 films from different countries like Bangladesh, Argentina, Australia, Brazil, Belgium, Bulgaria, Canada, China, and Chili were screened at the festival. Children Film Society Bangladesh has been organising the festival since 2008.